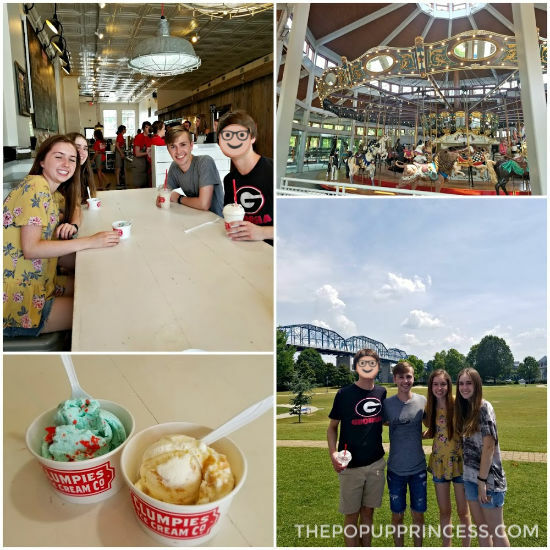 Chattanooga, Tennessee was the last stop on our summer road trip adventure. 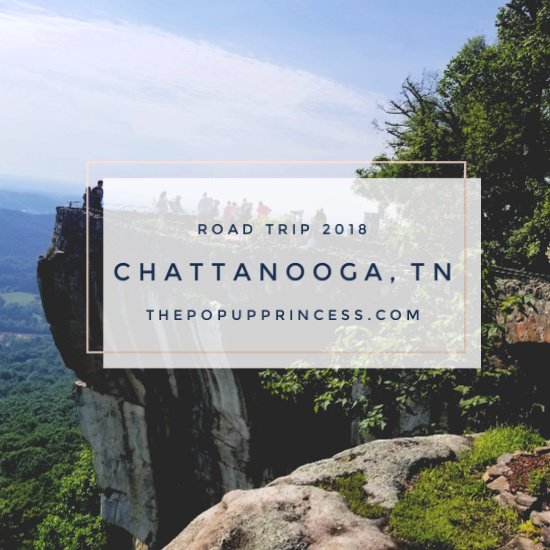 Well… technically, there were a couple of other stops, but the wheels kind of fell off the train after Chattanooga (more on that in another post). This stop was a big success in everyone’s book, though, because there was so much to see and do there. We ran ourselves ragged for a few days, and we really enjoyed our time in the city. 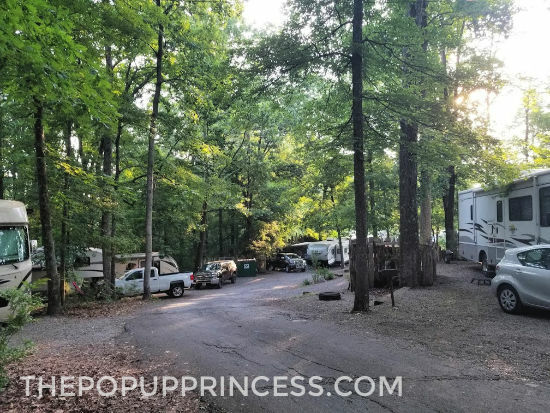 We stayed at Lookout Mountain/Chattanooga West KOA. It was a great little campground because it was pretty secluded and didn’t really feel like city camping. The campground was about 20 minutes away from downtown Chattanooga, so not too far from all the action. It was also close to the attractions at Lookout Mountain. 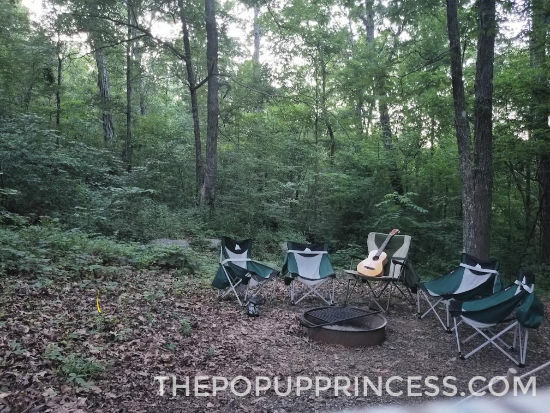 We paid around $55/night with our KOA membership for a full hookup site, which included a picnic table and fire ring with a grill. I will say a couple of our neighbors got a little loud, and considering the closeness of our sites, it was a little rough at night in a pop up camper. But even though the sites were a little close together, there was no one actually behind our site–it was all natural forest–so we did feel like we had space to spread out. That and the ample shade made the site worth it. What we gave up in site privacy, we gained in amenities. There were laundry facilities onsite, which is always a big plus for us on long road trips. The bathrooms were always clean, the showers were warm, and the staff was friendly. Even though the campground was full, we never had to wait for a shower. The kids liked that there was a pool and arcade just a short walk away from our site. 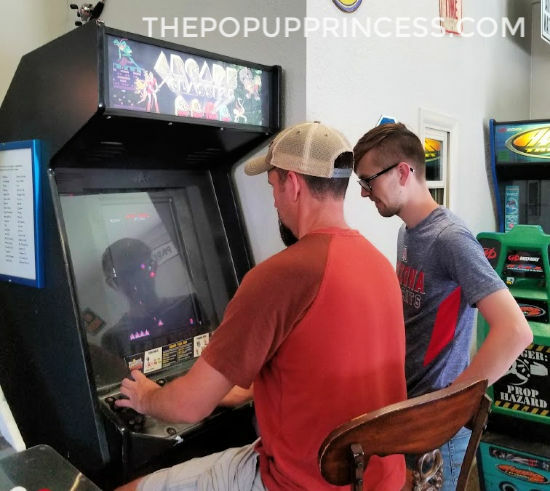 Of course, Justin had to school the kids on Galaga, since we had just listened to Ready Player One on the drive over. 😆 They were all about the 80’s video games after listening to that book. Over the course of our stay, the goal was for one of the kids to beat Dad’s high score. They tried hard, but no one ever beat him. For those with younger kids, Lookout Mountain/Chattanooga West KOA also has a playground and jumping pad. 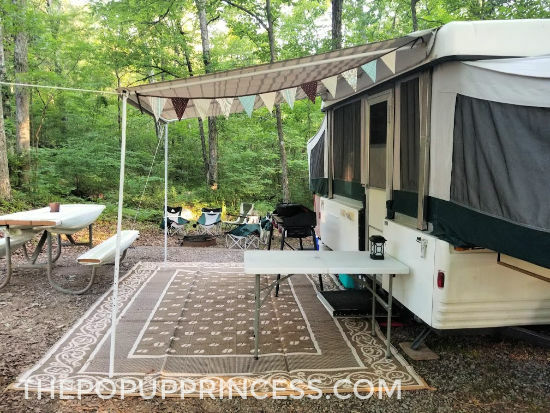 It was a very family-friendly campground, and we saw lots of children running around playing. We even saw our share of teenagers hanging out by the pool. It seems like a great vacation spot. There were plenty of families to socialize with in the evenings and more than enough activities in the area to fill the days with fun. We spent two full days in the city, and we jammed in as much as we could. 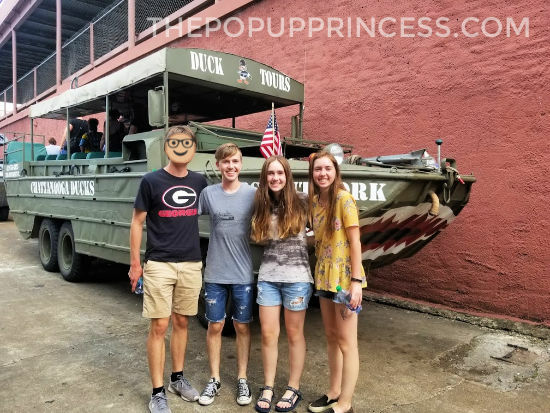 A childhood friend of my son’s had moved to Georgia a few years earlier, so he was able to drive up and meet us in the city. We hit the Tennessee Aquarium first. This place is amazing. Tickets are $35/per person, and it was money well spent. There are two buildings, and both are packed full of exhibits. Your ticket gives you access to both buildings. We spent the first part of the morning at the Ocean Journey building. Here’s where you’ll find jellyfish, sharks, and other oceanic life. Then we grabbed lunch across the street at Big River Grille & Brewery before finishing up at the River Journey building. It’s hard to pick a favorite because both buildings were really well done. From the aquarium, we walked across the Walnut Street Bridge down into Coolidge Park. We had heard about the antique carousel in the park, so we had to go take a look. My teenagers weren’t interested in taking a ride (sadly), but they did want to get a good look at it. I actually think they had ulterior motives for visiting the park. One thing they did not want to miss was Clumpie’s Ice Cream, which was just around the corner. I am pretty sure my kids looked up all the sweet treat places in the South, and they made sure we hit every one. 😉 Clumpies is definitely worth a visit, though. In fact, we hit it several times while we were in Chattanooga. The weather was hot, and the ice cream was amazing. It saved the day on more than one occasion. 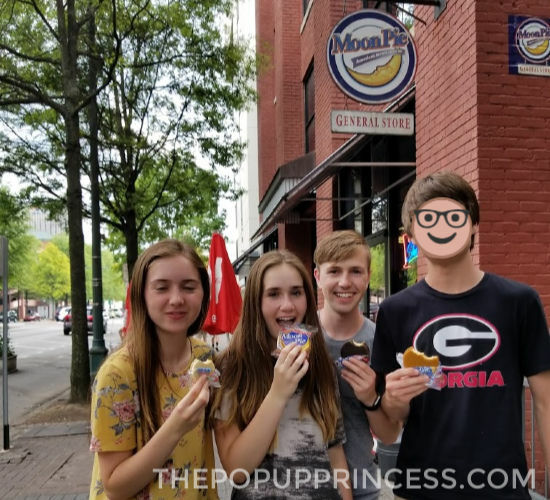 So we finished out the day with a Moonpie. I told you my kids knew where all the sweet shops were, didn’t I? I wasn’t kidding when I said there was so much to do in Chattanooga. We started day two out with a trip to Rock City. I honestly wasn’t sure what to expect, but we were told it was a must see. We bought a combo ticket–which included admission to Rock City, Ruby Falls, and The Incline Railway–at the gate for right around $57/per person. Rock City was our favorite attraction of the three. I’m not sure how to describe this place. It’s a little like a botanical garden. 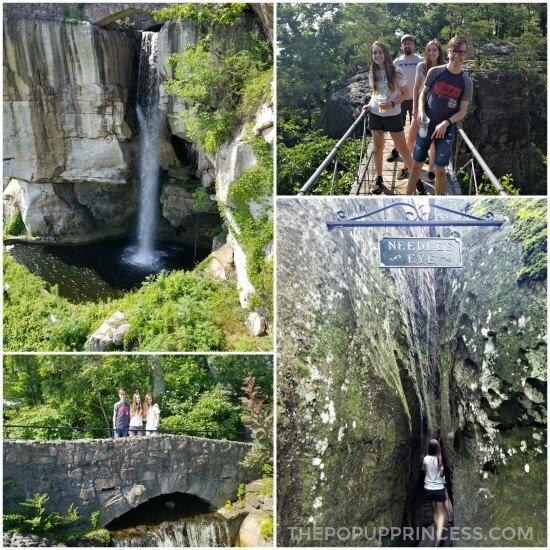 There are paths throughout the place, and my kids loved exploring the trails and rock alcoves. Once you get to the top of the trail–most of the trails converge here–you get a great view of Lover’s Leap. This is that iconic waterfall you see in all the Chattanooga promotional materials, and it really is beautiful. 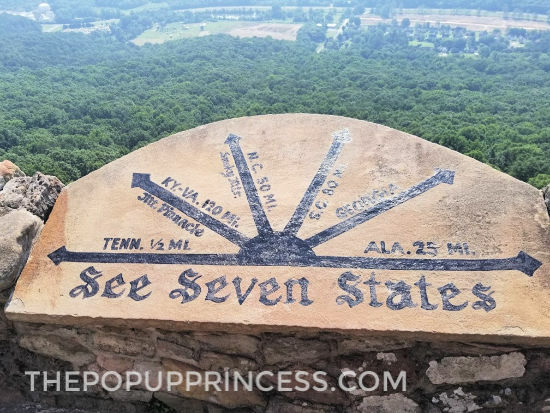 You also get a great view of the seven surrounding states from atop the mountain. 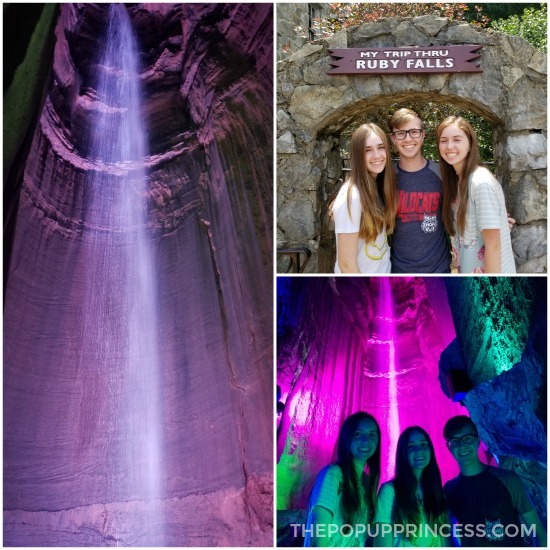 From Rock City, we went on to Ruby Falls. Ruby Falls is a cave within Lookout Mountain and home to the tallest and deepest underground waterfall open to the public in the United States. You descend 26 stories by elevator and take a guided tour through the caverns, ending at the waterfall. This place was so crowded, and I wish we had done the tour first thing in the morning. Parking was a nightmare, and we had to wait over an an hour to descend by elevator and join a guided tour. We were all getting cranky by this point. The tour itself was interesting, if a little crowded. There is only one way in and out of the cave, so you are constantly passing other tour groups and the passageways get a little tight. 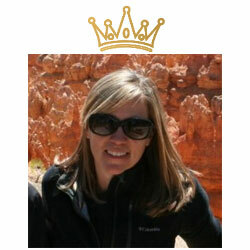 If you’ve been to other caverns–we had just visited Carlsbad Caverns–the cave isn’t all that spectacular. Many of the cave formations have been damaged over the years. The falls are quite pretty, though. There is a great light show that highlights the falls, and you are allowed a bit of time to snap pictures and take video before the next tour comes in. That waterfall made the tour worth the trouble. We were actually pretty famished at this point, so on our way out from Ruby Falls, we stopped at the first restaurant we came across. It was called The Corner Cafe, and it was delicious. If you pass this little cafe on your day at Lookout Mountain, stop for a bite to eat. It’s a little on the pricey side, but everything was amazing. After lunch, we hit The Incline Railway. I am really glad we ate before we got there, because the place was packed. We had at least an hour wait to ride the railway down the mountain, and there wasn’t much to see and do in line. Definitely don’t come to this place hangry. 🙂 Once we reached the bottom, we had another hour-long wait to ride the train back up. Thank goodness there was a Clumpies Ice Cream shop at the bottom station. The railway ride itself was really enjoyable. Definitely do it while you are in the area. 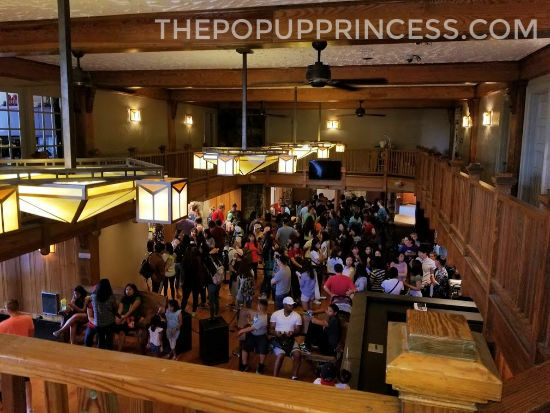 We weren’t really crazy about the wait times, but we visited on a Saturday, so I’m sure things are less crazy during the week. 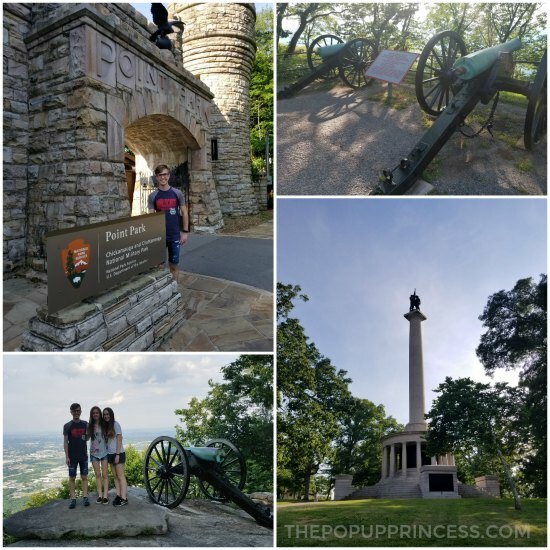 The top railway station is walking distance to Point Park, which is a ten acre memorial park that overlooks the Lookout Mountain Battlefield and the city of Chattanooga. There is a paved path, which takes visitors by several historic monuments and Confederate artillery positions. This place is a Civil War buff’s dream. There is also a visitor center, but we arrived just after closing, so we’d didn’t get a crack at it. The park itself is gorgeous, though, and we loved walking the paths. You can’t beat the views of the city, either. 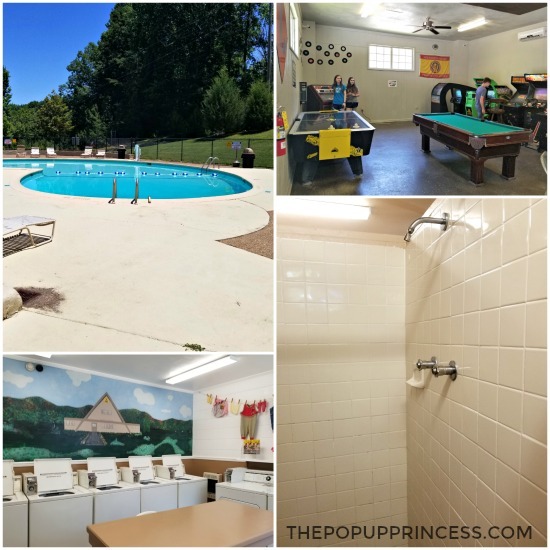 Lookout Mountain/Chattanooga West KOA is a great family-friendly campground. It’s got all the amentities you’d ever need, and it’s close to all the major attractions in the surrounding area. There are also a few other great campgrounds in the area. Racoon Mountain was suggested to us by several locals while we were in town, and I hear it is a great spot, too. There’s plenty to do in downtown Chattanooga. 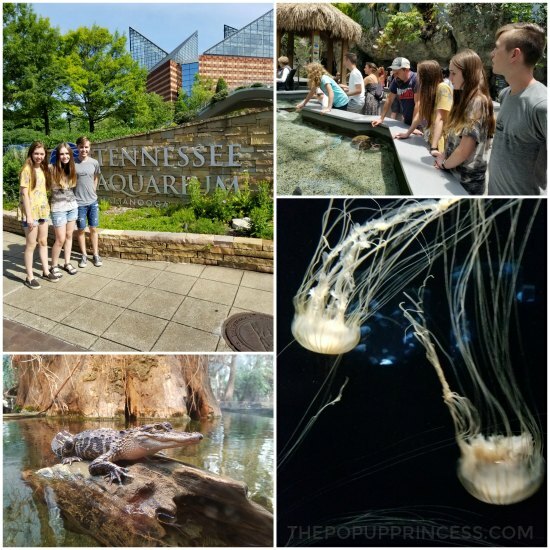 The Tennessee Aquarium is world renown, and definitely worth the price of admission. You could spend an entire day here and have plenty to do and see. There are also some great restaurants and coffee shops within walking distance. 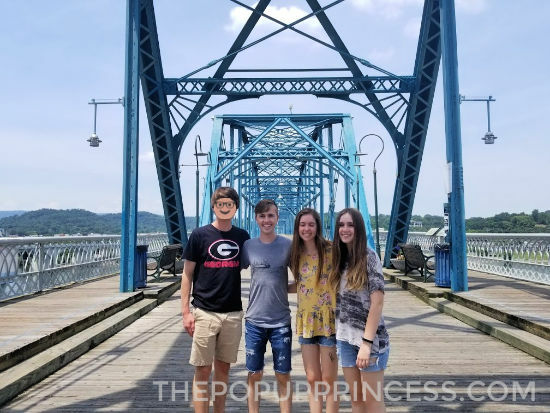 The Chattanooga Zoo is only about 10 minutes drive from the aquarium, and although we didn’t get the chance to check it off our list, it would make for a great morning as well. While you are in downtown, walk across the Walnut Street Bridge and hit Coolidge Park. It’s a pretty little park with an historic carousel, and Clumpie’s Ice Cream is only a few steps away. Yum! Don’t miss Rock City. It’s a little quirky, but a lot of fun. You’ll find the iconic Lover’s Leap there. It was one of our favorite attractions in Chattanooga. If you are considering seeing all the attractions Lookout Mountain has to offer, purchase a combo ticket. You can purchase them at either Rock City, Ruby Falls, or The Incline Railway gates. 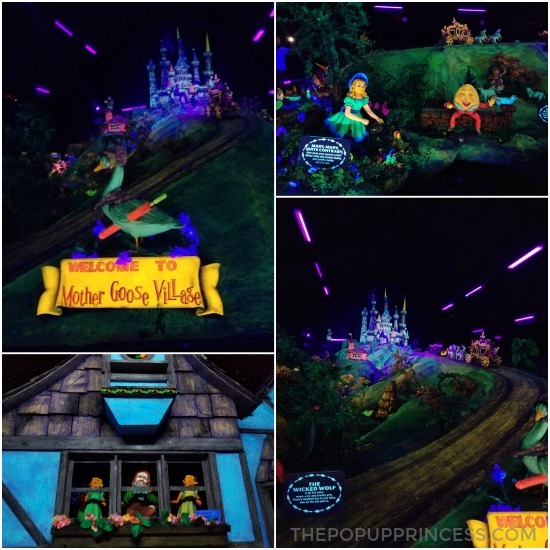 You’ll get admission to all three attractions and save yourself a little money. Visit Ruby Falls in the early morning, if at all possible. This place gets busy, and the parking is limited. Ruby Falls has fewer visitors in the early mornings and late evenings, so take advantage of the lull and plan to visit then. 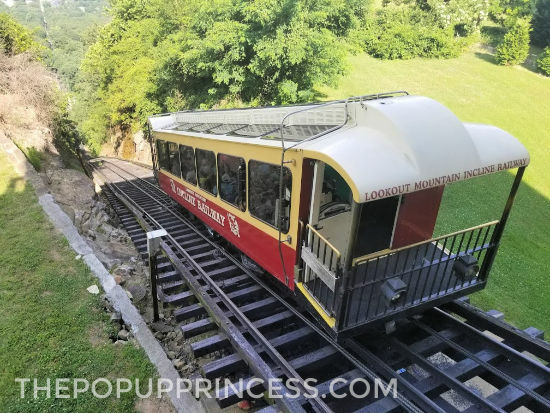 The same goes for The Incline Railway. Take a stroll around Point Park. 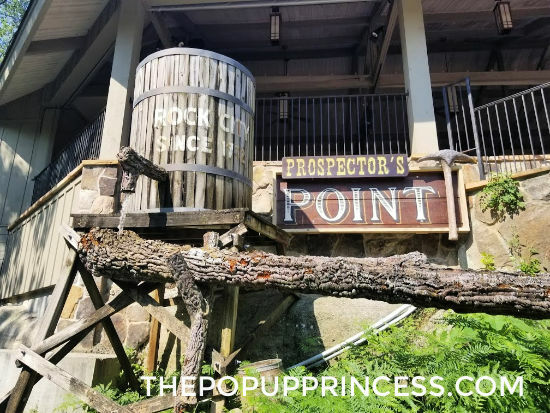 You’ll find beautiful views of the city and even learn a thing or two about the Civil War battles that took place on Lookout Mountain. Best of all, admission is free is you have an America The Beautiful pass and only $7/person if you don’t. That rounds out our time in Tennessee. From Memphis, to Nashville, to The Great Smoky Mountains, and now Chattanooga. It’s hard to believe we fit so much adventure into one state. Tennessee, you were amazing! Thanks for having us. We thoroughly enjoyed our time in the South, and we’ll definitely be back. Let us know what Tennessee “must-sees” we missed in the comments section, so we’ll be sure to hit them next time around.